Suncheon-si, Tuesday 10 September, 11:30am. As we emerge from the container tunnels on the western bank of the river we are beginning to wilt in the heat and we are sorely tempted to exit the expo at the nearest gate. But then we catch sight of a frozen (and non-alcoholic) cocktail stall which gives us the refreshment we need to sustain us for another half hour or so. Looking at the size of the area still to be covered, we have to make some tough choices. On the one hand we could stay on the west side of the river and stroll over to the Korean garden, or cross back to the east and explore the remainder of the peninsula which contained many of the gardens sponsored by many of the other participating countries. 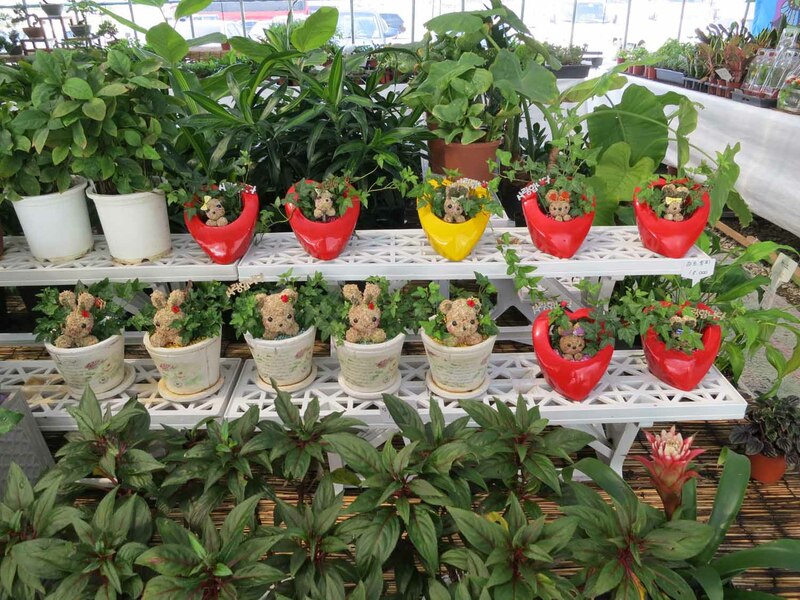 Among the attractions back on the east side of the river was the French Garden, the British Garden, the Oriental Herbs Experience Center, the Kindness Forest, a medicinal herb garden and much more. I also miss out on the trees donated by numerous celebrities including Soprano Jo Sumi’s “Tree of Triumph” (a magnolia), singer Jang Sa-ik’s Sori Tree (a zelkova serrate) and footballer Ki Sung-yueng’s Tree of Dreams (an elm). Ki is one of Suncheon’s best-known sons, and is one of the official ambassadors for the expo. With the clock ticking and the energy levels falling, we decide to visit the Korean garden to round off our morning. The Korean garden contained a number of different sections modelled on different styles of traditional garden. As you entered the main gate, there was a Palace garden: a square pond with a round island, a pavilion on one side, with gates the other side of the pond leading to a section of garden raised on stepped stone terraces. Sound familiar? Yes, this section of the garden is heavily influenced by the Buyongji (lotus pond) in the Biwon behind the Changdeokgung in Seoul. It also contains echos of the other main royal palace, the Gyeongbokung, in the decorated brickwork of the chimneys on the terraces at the side of the pond, and the gate which resembles that in the back garden of the Gyetaejeon (the queen’s quarters). Behind the Palace garden was something less enclosed and less formal, a nobleman’s garden. There were still pavilions, pagodas and water, but in a much more naturalistic setting, and rocks were a more important part of the landscape. 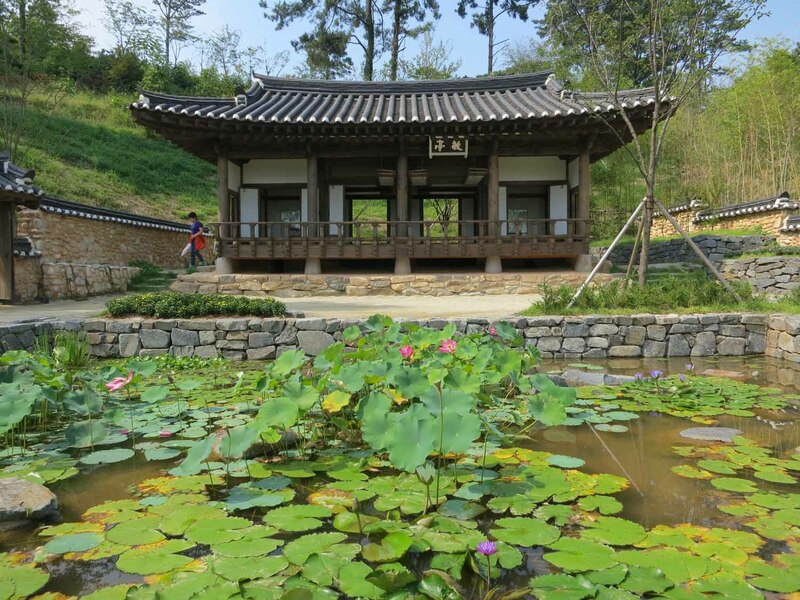 The space is intended to recreate the atmosphere of the garden of a yangban who has withdrawn from life at the court to attain scholarly enlightenment through contemplating nature and reciting poetry and studying the Confucian classics sitting in his pagoda. On emerging from the Korean garden we stroll slowly to the western gate of the Expo, look briefly around a large garden centre which encouraged you to buy a living souvenir of your visit, and catch a shuttle bus back to the East gate where we entered. We return to the information kiosk for foreigners, where they have kindly assembled some press materials for me, and we walk back to the hotel under the shade of our umbrellas. I can only wish that I’d visited the Expo in the first month of its opening, when it was still springtime; or that I could see it in October, when the fierce summer heat will have come to an end. It would be very easy to spend a whole day, or more, there. But the Expo area will stay open as a permanent tourist attraction: the Expo itself was profit-making for Suncheon City1 and they have allocated budget to staff the site to welcome visitors in the future. Probably some of the national gardens will not be maintained, but hopefully more money will be found to finish all the planting in Hwang Jihae’s garden. The important decision that landscaping should be a major feature of the Expo precincts means that there will always be a reason to visit, independent of whatever temporary floral colour is on show.